A food poisoning outbreak that affected hundreds of people in Newcastle was caused by uncooked curry leaves, an investigation has found. More than 400 visitors to the three-day Street Spice event reported symptoms of diarrhoea and vomiting - with 29 confirmed as having salmonella. 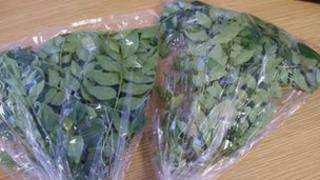 Health experts found curry leaves used raw in chutney were contaminated by several different bacteria. Public Health England (PHE) said it was one of the UK's largest outbreaks. The investigation by Newcastle City Council and PHE found that in addition to salmonella, other organisms including E.coli and Shigella could also have caused illness. PHE said it was the first time one of the strains of salmonella had been detected in the UK. Newcastle City Council said it had "carefully considered" the facts and had decided against formal action. Stephen Savage, director of regulation and public protection, said: "This decision, based on our enforcement policy, takes into account the lack of clear, official, advice about the use of curry leaves and the overall good standards of food hygiene at the festival. "We have recommended to the Food Standards Agency that they should develop information to be circulated nationally about the preparation of curry leaves and other herbs. "We will ensure that this advice is given to the local restaurant trade." An estimated 12,000 people attended the event at the Centre for Life in Newcastle between 28 February and 2 March.